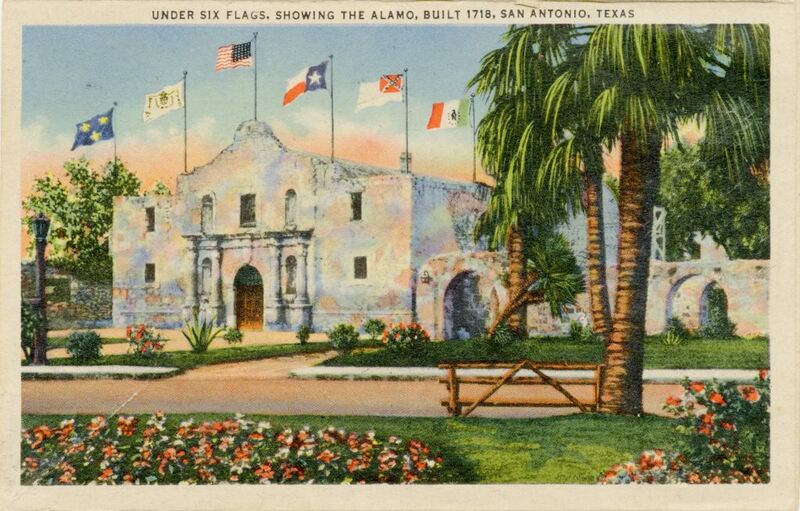 A postcard depicting the Alamo Mission in San Antonio, Texas. The Alamo is best known as the site of the Battle of the Alamo, where Texian soldiers were defeated by the Mexican Army during the Texas Revolution. The Alamo was first constructed in 1744 for use as a Spanish mission for the religious education of Native Americans until 1793. 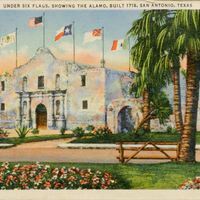 “Under Six Flags, Showing the Alamo, Built in 1718 Postcard.” RICHES of Central Florida accessed April 24, 2019, https://richesmi.cah.ucf.edu/omeka/items/show/6803.